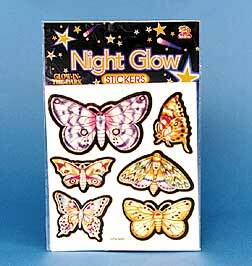 Lovely assortment of glow-in-the-dark butterflies from 1 inch to 3 1/2 inches. $10.50 per dozen for 12 dozen or more. $9.35 per dozen for 24 dozen or more.